This six-session small-group kit equips small groups to foster closer relationships with one another, with family, with friends, and with God. Following the ideas in his book I'd Like You More if You Were More like Me, John Ortberg invites readers to look past their smartphones and reflect on the joys of everyday interactions. This small group connection kit also includes ideas on using technology for the benefit of relationships, and it offers digital resources such as recipes, icebreakers, and additional deep-diving questions. Everyone was created for relationships. This small group kit shows readers how restorative-and how easy-true intimacy can be. 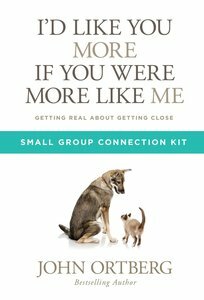 About "I'd Like You More If You Were More Like Me (Small Group Connection Kit)"
Customer Reviews For "I'd Like You More If You Were More Like Me (Small Group Connection Kit)"
This book explores intimacy with God, family, co-workers and friends. I loved how John defined intimacy. He uses many personal examples and quotes especially from Dallas Willard and many others. I found this book very helpful in helping me learn and grow in the area of positive relationships. There are many solid biblical principles to take from this teaching.